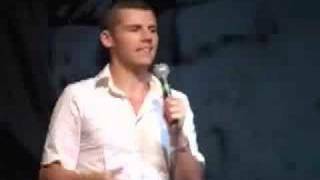 Des Bishop was born in New York, but raised in County Wexford, and forged his stand-up career in Ireland, running the International Comedy Club in Dublin for several years. His first Edinburgh show was Comic Warfare, in 2002, which received a Tap Water award, the anti-corporate answer to the Perrier. He landed his first TV series, The Des Bishop Work Experience, on RTÉ Two in 2004, which saw him trying to survive doing minimum-wage jobs. Another RTE show, Joy In The Hood, saw him teaching stand-up to people in impoverished areas of Ireland's major cities. In 2008, he took on the Irish language, with the TV series In the Name Of The Fada charting his attempts to pick up enough to perform an entire stand-up act in the language. Bishop also appeared in the 2002 film, In America, in which he played a high stockbroker rapping in the back of a NYC taxi cab. He was diagnosed with testicular cancer in 2000, and had one of his testicles removed - but turned the experience to his advantage, and created a stand-up show about it. Des Bishop has pulled his gigs this weekend after his mother, Eileen, died. The comic paid tribute to the 'amazing woman' on Twitter, saying she 'dropped an F bomb in her last words. She died surrounded by her three sons, also including fellow comic Aidan. 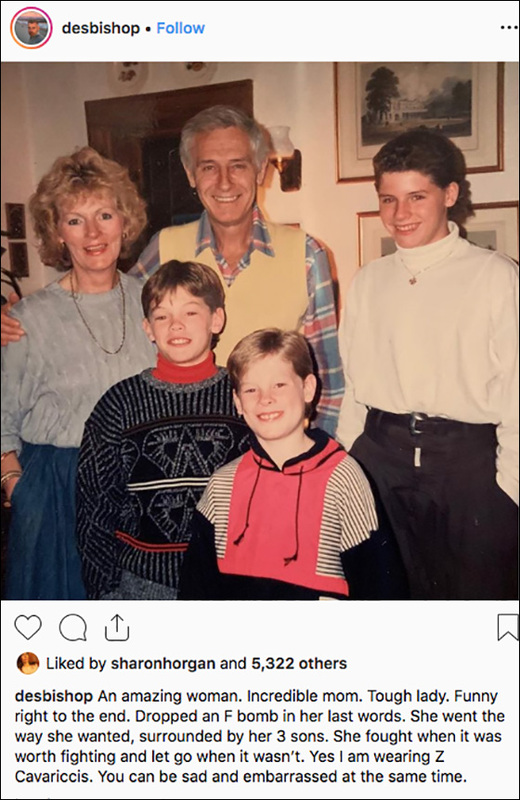 Posting an old family image, he also made a joke about his own youthful fashion sense, saying: 'Yes I am wearing Z Cavariccis. You can be sad and embarrassed at the same time. The Irish-American comic had been due to play Galway's Town Hall Theatre tomorrow and Saturday. Dates will be rescheduled and the venue said it would be contacting ticket-holders. He is due to start a month-long run of his new show, The Comments Section, at the Melbourne International Comedy Festival next Thursday. We do not currently hold contact details for Des Bishop's agent. If you are a comic or agent wanting your details to appear on Chortle, click here.